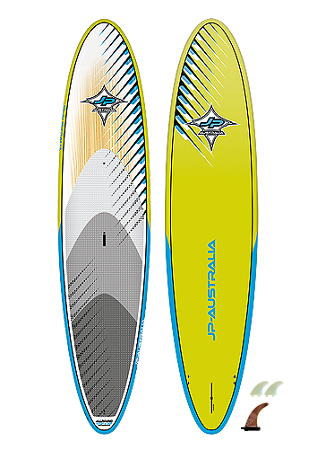 The range of use of these JP Australia Allround longboard style SUPs is simply amazing. They work great for SUP beginners, flat water cruisers, first time wave SUPers and for wave experts. They are super easy to ride and turn, surprisingly fast and work in pretty much any condition. A concave nose, based on longboard designs, creates more lift when touching the water and avoids nose diving. Very round rails and tuck, like surfboards. When standing in the middle of the board, the relatively flat deck curve makes it easy to keep the balance during paddling. Very stable and versatile, making it the perfect beginner board! Because of its long waterline it is an excellent glider for open ocean, rivers, inner city waterways or lakes. The 31? width and the slightly fuller rails make it so stable that catching a wave is child’s play. Despite its large size this board is very maneuverable. A smooth rocker allows the board to turn tightly enough to carve out a wave face. A sharper tuck line in the tail area gives the board enough traction to be used as a windsurfer! Just rig up and cruise around. This is the ideal all-round board for resorts and windsurf centers. Fun to use with or without wind; whether paddling or sailing, the whole family can get on and play. PADDLER PROFILE They work great for SUP beginners, flat water cruisers, first time wave SUPers and for wave experts. JP Australia Wide Body 10'x33.5"